BEIRUT - Syrian security forces opened fire Friday on protesters and hunted them down in house-to-house raids, killing about 30 people in the deadliest day in weeks in the country's 7-month-old uprising, activists said. Much of the bloodshed Friday happened after the protests had ended and security forces armed with machine guns chased protesters and activists, according to opposition groups monitoring the demonstrations. Authorities disrupted telephone and Internet service, they said. The Syrian opposition's two main activist groups, the British-based Syrian Observatory for Human Rights and the Local Coordinating Committees, gave figures for the protesters killed on Friday ranging from 29 to 37. The flashpoints were Homs and Hama in central Syria, where opposition to the regime is strong. Hama is the site of a massacre nearly 30 years ago which has come to symbolize the ruthlessness of the Assad dynasty. Communications were spotty Friday in the Damascus suburb of Douma and in Homs. The move appeared to be an attempt to cut off the opposition's ability to organize and report on the protests. The regime appears to lack sufficient numbers of loyal troops to garrison all the centers of unrest at the same time, so government forces will often sweep through an area in the wake of protests, breaking up new gatherings and hunting activists, before being deployed elsewhere. The result has been a monthslong stalemate. Still, the capture and subsequent death of Libya's Moammar Gadhafi, under still-unclear circumstances, has energized the opposition. 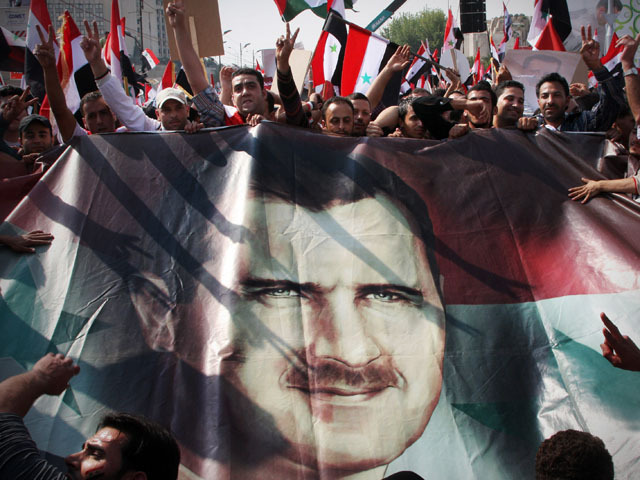 Last week, thousands of Syrians took to the streets shouting that Assad will be next. The protests come amid efforts by the Arab League to end the bloodshed, and debates within the opposition on how to bring international pressure to bear on the regime. On Friday, many protesters said they wanted a no-fly zone established over Syria to protect civilians in case the Syrian regime considers attacking protesters from the sky, the activist groups said. The protesters also called for international monitors, although most opposition groups reject the idea of foreign military intervention. The Syrian government insists the unrest is being driven by terrorists and foreign extremists looking to stir up sectarian strife.